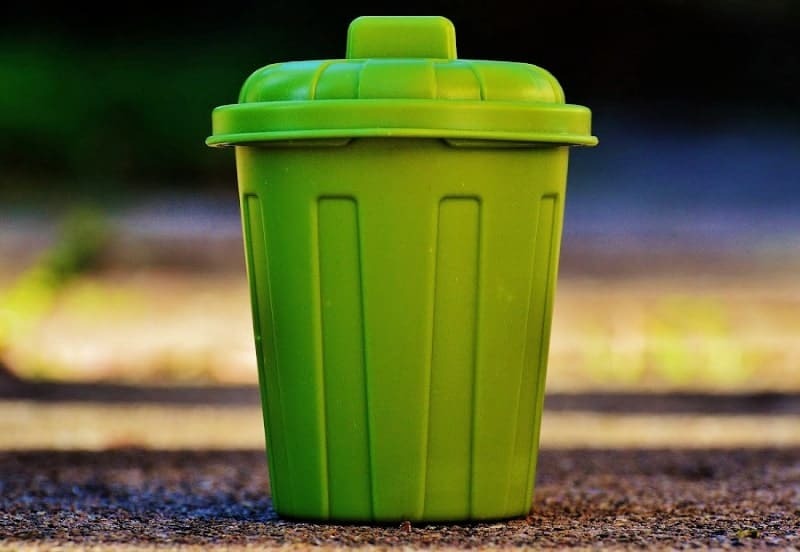 Knowing how to clean trash cans properly, and doing it as part of your cleaning routine, will go a long way toward eliminating household odors and fruit flies. Few things are nastier than walking into a home that reeks of garbage unless it’s having to swat away flies that hatched on that filth. 1. Put on the gloves: Garbage cans are full of nasty and sometimes dangerous bacteria. Don’t risk getting sepsis or another serious infection — wear the gloves! 2. Work outside: Some people wash trash cans in the sink or bathtub but then you’ve got to clean and sanitize them thoroughly when you’re done. Work outside if you can to save yourself an extra step. If you must work indoors the sink is a better option than the tub since it’s easier to clean when you’re done. 3. Empty the can and remove as much gunk as possible using the rags or paper towels. 4. Hose it out to remove the first layer of grime. Then, using the long-handled brush (or a toilet brush used specifically for cleaning garbage cans), scrub the bottom and sides. Rinse and repeat until you’ve removed the food stains and spills. 5. Add hot water to the bottom of the can then pour in 2 cups white vinegar and 1 tablespoon of dish soap. Using the long-handled brush again, swirl the vinegar solution around the interior of the can, wetting down every surface. Allow this to sit 20-30 minutes for disinfection. 6. Dump it out in the gutter or down the drain. Do NOT dump it on your plants or lawn–the vinegar will kill them. 7. Rinse and sun-dry the empty garbage can to help kill remaining germs and bacteria. Remember, plastic trash cans are porous and will hold on to germs and odors more than metal cans. Adding a layer of used newspapers and a sprinkling of baking soda will help control spills and odors between cleanings, and will make it far easier to remove messes in the future. 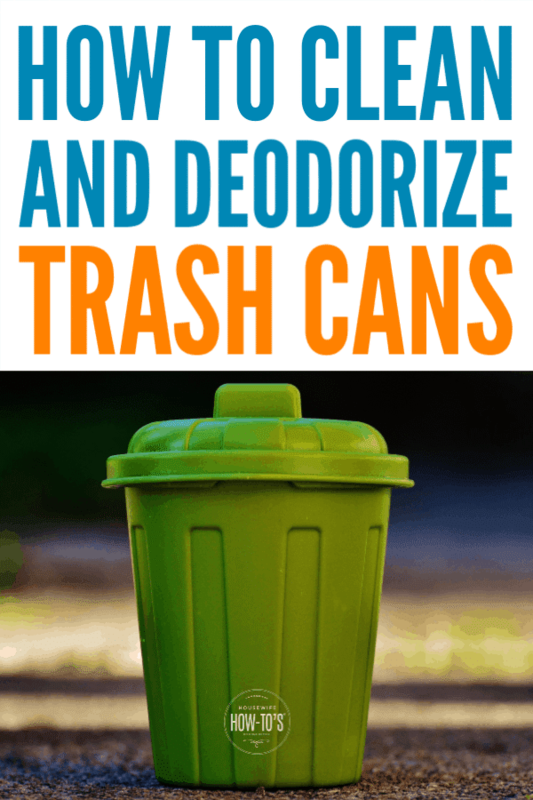 Keep your trash cans odor-free between cleanings by lining them. In the kitchen, use the thickest garbage bags you can afford. Plastic grocery bags make inexpensive liners in the bathroom and bedroom where you don’t usually need to worry about leaks. This is a good article about the science of cleaning & disinfecting; vinegar, what it can and cannot do. It is a fabulous cleaner for certain things around the home. Disinfecting? Not so much. Please reconsider claiming that it is a disinfectant. I think what we need to remember is that vinegar is not a registered disinfectant. Vinegar’s 5% acetic acid is sufficient to kill most germs, and certainly enough to kill those in a trash can. Does it kill salmonella? No. But are you planning to eat out of your trash can? Hydrogen peroxide 3% — the one available at grocery and drugstores — does have antibacterial and some disinfectant properties. It’s excellent at disinfecting wounds, for instance. But when sprayed on household surfaces it can lead to discoloration, which is why I didn’t recommend it here. I do recommend it elsewhere, however. So, keep in mind that what we want to use on a surface depends on the way we use that surface. Vinegar works for trash cans since you’re not going to eat out of them. For cutting boards and other areas prone to cross-contamination, I do recommend hydrogen peroxide. I’m sorry yours broke. I’ve never heard of a trash can that can’t be washed! Hopefully your family is neater than mine; our can gets splatters everywhere. Ugh. If you let your plastic containers dry in the sun, do it on a temperate day. I did it when it was 88 degrees farenheit outside, and the sun warped the plastic. Now when I open the can, the lid flies off and it never did before. We’ll have to buy a new can. %$#@&^%!! I find this is a good way to clean children, too. I’m kidding…not really.